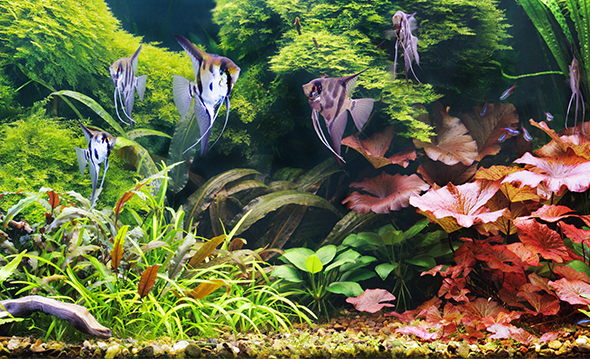 In heavily planted aquariums there is no balanced between fish and plants. Because of the large amount of plants, there is a short of nitrates and phosphates to achieve healthy plant growth. That is why FloraGrow PRO contains plant nutrients nitrates and phosphates to supplement this shortage. Heavily planted aqaria can not without CO2 systems. Colombo has different systems for small and large aquariums. FloraBase Pro is a unique base, made in Japan. The pellets remain their shape and do not disintegrate. FloraBase Pro is rich in nutrients the open structure provides for healthy roots. 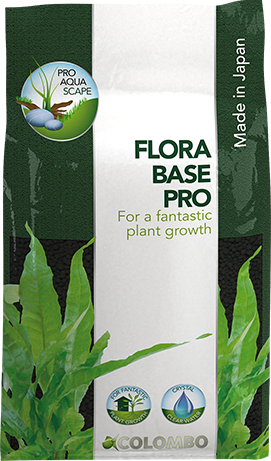 FloraBase Pro reduces and stabilizes the pH-value to 6. With a pH of 6 there is a sufficient amount of CO2 available for healthy plant growth. The CO2 level of the water is of great importance for optimal plant growth. In the chart you can see that the CO2 absorption at a pH-value of 6 is approximately 80%. When the pH-value is higher, the absorption decreases significantly. Starting a new aquarium is much easier when FloraBase Pro is used. When the pH is under 7, the ammonia excreted by fish will form as ammonium instead of the toxic ammoniac. You can make your base by using solely FloraBase Pro, in this case there is no need to cover the FloraBase with gravel. Or use NutriBase and cover this with a layer of FloraBase Pro to provide a maximum amount of nutrients for plants. For example Shrimps and Discus fish prefer a pH-value around 6. These animals love FloraBase Pro! FloraGrow Pro is a liquid fertilizer for heavily planted tanks, for example so called ‘Aqua Scape’ tanks. In co-operation with aquarium plant nursery ‘AquaFleur’ we have developed this unique fertilizer. FloraGrow Pro contains all the essential nutrents for heavily planted tanks, in a well-balanced composition. Nitrates and Phosphates are added as well. In moderately planed tanks these nutrients are sufficiently available because they originate from residues left by filtration and from fish food. In heavily planted tanks Nitrates and Phosphates must be added, in this case the use of FloraGrow Pro is recommended. Flora-Grow FE-tabs provides Iron to the roots. Some plants completely depend on the supply of Iron through their rooting system. By pressing the FE-tabs into the base it will be enriched with premium iron. FE-tabs are made from Laterite clay a natural source of Iron.